Fifteen human rights campaigners, dubbed the Stansted15, are on trial for preventing a chartered immigration removal flight from taking off from Stansted airport on 28 March 2017. The plane was due to deport 60 people to Nigeria and Ghana. Originally charged with ‘aggravated trespass’, a second and more serious charge of ‘endangering an airport’ was added in July 2017 at the request of the Crown Prosecution Service. A terror-related charge, this is the first time that activists have been charged with this offence, which carries the maximum sentence of life imprisonment. The original charge also still stands. The defendants, Benjamin Smoke, Joseph McGahan, May McKeith, Nicholas Sigsworth, Helen Brewer, Lyndsay Burtonshaw, Nathan Clack, Laura Clayson, Mel Evans, Jyotsna Ram, Alistair Temlit, Edward Thacker, Emma Hughes, Ruth Potts and Melanie Stickland, aged 27 to 44, have all pleaded not guilty. The trial started in March but was adjourned until 1st October and is now in its seventh week. The defence case is drawing to a close and the trial is expected to last eight weeks. The prosecution began with laying out their arguments and 12 prosecution witnesses gave evidence. The agreed facts of the case were outlined before the defence opened on 5th October with freelance journalist Benjamin Smoke the first to be called to the witness box. Smoke, a member of Lesbians and Gays Support the Migrants, said that he had learned about three people who were due to be deported from the Detained Voices website, a blog that publishes the stories and demands of people held in UK immigration detention centres. Questioned by defence barrister Dexter Dias QC about why he was involved in blocking the plane’s take-off, Smoke said that he knew that these people would be in danger if the flight was not stopped and felt it was necessary to do something to stop their deaths. Since Smoke, six more defendants have testified. They have talked about their concern for the three people on that flight who were known to Detained Voices, and why they took direct action: not just to protect people from being sent back to a country they feared, but to protect them from the flight itself. 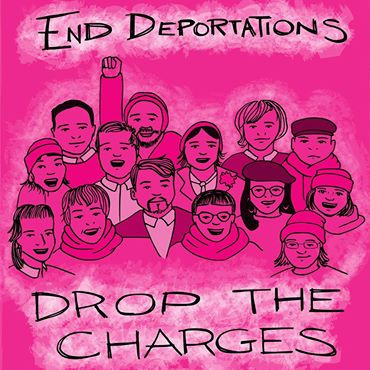 Many of the 15 have been involved for a number of years in campaigning against deportations, attending demonstrations outside detention centres and the Home Office, and supporting people going through the asylum process. In court some of the witnesses voiced their frustration that these actions hadn’t resulted in change. Musician Nicholas Sigsworth, originally from Yorkshire, told the court that he had been to protests outside Yarls’ Wood and Dungavel Hall in Scotland but had seen no improvement in the situation afterwards. When pressed by prosecution lawyer Tony Badenoch QC during cross examination, on 12 November, as to why he hadn’t told the police about his concerns for the people due to be deported instead of blocking the plane, Sigsworth said that when people he knew had contacted the police in the past, they had been told it was a Home Office matter. The defendant felt that people more qualified than him had already been communicating with the Home Office before the night of 28 March. Asked why he didn’t involve his local MP, he told the court that it would have been too late. Wrapping up his questions, Badenoch addressed Nick Sigsworth: ‘You entered a restricted area, you didn’t know what you were doing, you broke the law’. ‘I did what I did to prevent harm to those people, on my understanding that if someone is at risk of harm you can break the law’, Sigsworth answered. ‘You took the law into your own hands’, stated the prosecution lawyer. Emma Hughes, seven months pregnant, spoke of her experiences of supporting people facing deportation, most notably as part of a group in Cardiff. ‘We weren’t able to do anything to do stop it. Someone spoke to him on the phone after the flight. He had mental health issues and had been restrained, it would have been really traumatising. We didn’t hear from Bibi again. We thought that he had been put in prison by the regime. Later, I travelled to Azerbaijan and got to know more about the regime and about the political prisoners there; I thought that Bibi is one of those prisoners’. Hughes said that after this point she became pretty involved in the issues of deportation and detention. She told the court that she had previously called commercial airlines to tell them not to deport individuals at serious risk. But the plane that was used on 28 March was a Titan airlines plane. Titan is a private charter company so calling them wouldn’t have worked, she explained. The prosecution case rests on whether the actions of the group were unsafe, thereby endangering an airport, or not. As such, the cross examination has focused on the preparation and the execution of the action, that involved walking on to the ‘apron’ at Stansted, putting up two tripods with people using ‘lock-boxes’ to secure themselves to each other and to the bottom of the tripods. The police took several hours to cut them out, leading to the delay and ultimately the cancellation of the immigration deportation flight. Meanwhile, the defence argues that the 15 took necessary action to protect the human rights of people who were at risk of torture, imprisonment or death if they were deported, with witnesses testifying about the nature of charter flights. A replacement flight took off from Stansted airport two nights after last year’s direct action with only 23 people on board; 34 people were able to continue their asylum claims. A year and a half later, 11 people are still in the UK.